Out of the evil inhumanity from the Holocaust came some courageous heroism by many. As we are nearing, on this Holy Week, the important holidays from the great religions of Christianity and Judaism - Easter and Passover - let us remember this British humanitarian, one of many courageous Christians, who saved Jewish lives during the Holocaust. His name was Nicholas Winton and he would become Sir Nicholas Winton [he was blessed to live to 106 years old]. 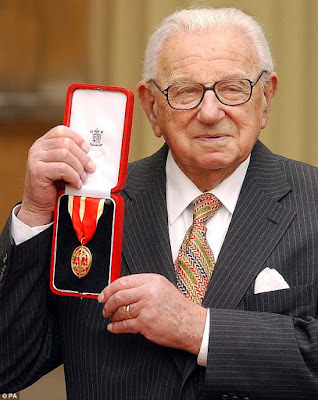 In 1938, in what would become known as Operation Czech Kindertransport, Sir Nicholas Winton saved hundreds of Jewish children mostly from Czechoslovakia [sic] from the Nazi death camps, transporting them to safety in Great Britain. It would be almost 50 years before the world would know of this man's great humanity in the face of evil. He kept his act of courageous heroism to himself. He would be known later in Great Britain as, "The British Schindler". Thanks to this post I found on You Tube video from Dil Bole Indiaa of the BBC television program that aired in 1988 called "That's Life". May God forever bless Sir Nicholas Winton and his family.